With the help of the 3 fairies, Aurora prepares for a night of dreaming about her true love's kiss. 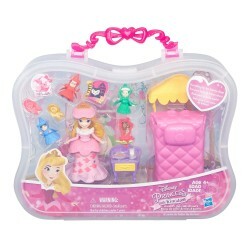 Aurora's Fairytale Dreams is conveniently packed in a plastic carrying case for easy storage and play-and-go fun. 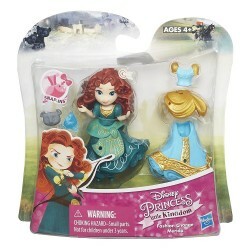 The set includes the 3 fairies, a canopy bed, a nightstand with snacks, and Aurora. The doll comes dressed in a removable plastic bodice, skirt, and peplum. Your little dreamer can keep the fun going by creating Aurora's outfit and accessorizing her with the included Snap-ins. They can also decorate their Disney Princess with mix-and-match Snap-ins and outfits (sold separately) and can build their own Little Kingdom! •Includes doll, bodice, peplum, skirt, canopy bed, 7 accessories, and 2 Snap-ins.